The Louisville Courier Journal newspaper in Kentucky has been documenting the opioid crisis since it first gripped the state. The BBC followed a reporter in Lawrenceburg as she grappled with its impact on her own community. 'They need to go to prison." 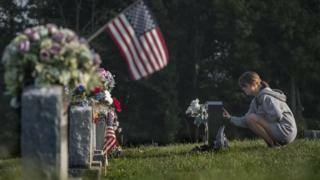 On a Sunday evening in September, Emily Walden spoke at a moving candlelit vigil organised by Parents of Addicted Loved Ones in Lawrenceburg, Kentucky. "'They'" are pharmaceutical company executives - she holds responsible for the prescription drugs epidemic which claimed over 72,000 drug related overdose deaths last year. "Money's not enough we need to show enough is enough - putting them in prison will deter the next company from doing this", she said, calling on US Attorney General Jeff Sessions to file criminal charges. Since 2012 Emily has been campaigning after she lost her 21-year-old son, TJ, to an overdose of the drug Opana. "My son went on a camping trip with friends. The next day a police officer knocked on my door and told me he had passed away. He was 21 years old. He was almost 18 when he first was offered an OxyContin. It was a short period of time, he went into treatment. He went through periods of time when he was doing well, then others when it was not. "He told me he wanted to get better. He didn't fight me a lot - he said I know you want to help me - even when I was mean and took things away or drug tested him - he knew I wanted to help him," she recalls. Despite her efforts - including tracking down and speaking to his drug dealers - Emily lost her son, and since then has focused relentlessly on the drug, Opana, and the company that manufactured it. "Every day I think about him and everything that could have been. When he went to treatment he told everybody in the centre when I was going to visit - he said whatever you do don't mention Opana in front of my mom because she will go crazy. "So, I think he'd look down on me a few times and laughed about it because even back then I was very upset and couldn't understand why he had access to such a dangerous drug. Oxymorphone should never have been put back on the market, ever." She took her case to Andy Beshear - now Kentucky's Attorney General - and before he was elected, Emily asked him to investigate. A year ago, November 2017, Kentucky filed its first lawsuit against an opioid manufacturer and now has seven lawsuits in total against different manufacturers. The state wants the cases to be heard in Kentucky - not as part of a bigger multi-action case being heard in Cleveland, Ohio. According to Wes Duke, assistant director Medicaid fraud control unit at the Attorney General's office Kentucky, if the state's civil cases are successful they would want any payments for financial damages from the pharmaceutical companies to pay for drug prevention education, law enforcement and treatment. He points out that these are civil cases - to meet Emily's hopes for a criminal case against the company's executives, he says, "You would have to prove criminal liability that the executives were aware. That possibly could exist but these cases are civil." In the early days of her campaigning, Emily was inspired by an article written by Laura Ungar, an investigative journalist with the Louisville Courier Journal, who has written extensively on the opioid epidemic since 2011. Several years back she told Laura that it had been one of her articles which inspired to start a local pressure group called Fed Up at the start of her campaign. "I met Emily at a forum the Courier Journal held in 2016 - Emily just came up to me and said, 'hey I have read some of your stories and want to talk to you because I lost my son,'" says Laura. "I had travelled to Florida to write about the pill pipeline which was a huge problem. A woman there set up a group called Stop Now. Emily read my story and focussed on that group and contacted the woman and ended up starting a chapter in Kentucky because of the connection she made based on reading my story. "She has kind of taken it upon herself to do all she can to stop pill abuse and particularly do something about the regulatory side of things. She goes to Washington to get the [US Food and Drug Administration] to crack down more on pharmaceutical companies because she things that can stop other kids from dying. "I was very touched that my story did this. And I would have never known that my story made this change without her coming up to me. It's always gratifying that when you put something out that it is doing something. And you think about those times when you put your stories out in the world and you didn't know about it." 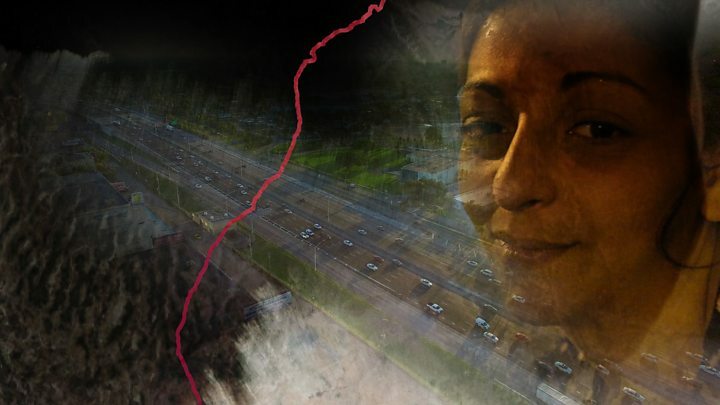 This summer Laura travelled back to a town called Austin, in nearby Indiana, researching a follow-up to her 2015 story which exposed how the town had suffered rural America's worst drug-fuelled HIV outbreak in recent history. People had found a way to inject Opana ER multiple times while sharing needles. In returning in 2018, the Courier Journal wanted to tell the story of how Austin was trying to recover - "a beacon of hope" as editor Rick Green described it to his team who were working on this project. As part of her campaign, Emily Walden testified last year to the US Food and Drug Administration (FDA) against Opana ER. In July 2017, the FDA asked Endo to withdraw the drug in what was the first time the agency had taken steps to remove a currently marketed opioid pain medication from sale due to the public health consequences of abuse. Emily makes a point of clarifying her motive. "I am not going after this because my son died of that drug. The research I did and what I found out about that drug is the reason I pursued it. He should have never had access to it. Many, many other people should not have. It's a very dangerous drug that should have not been put back on the market." Emily estimates she puts in 40 to 50 hours a week, voluntarily, on top of her full-time job. She says addressing meetings is not something she had done before her son died. "I struggle each and every time," she says. The difficulty of reporting on the opioid and addiction epidemic is also something that is taken personally by Laura. 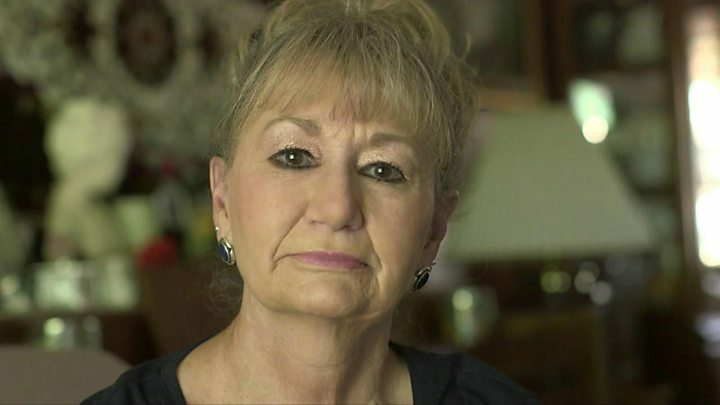 She recalls the most "heart-wrenching" story she has covered in almost 30 years of reporting - when she visited the local hospital where drug-dependent babies were being treated. "It not only shows how addiction affects not only the people using drugs, but their families and the most innocent members of our society. "As a mom of two who has held my babies, holding these babies when they were shaking and crying and could not be consoled -I'll never forget It - it was more than your normal day doing journalism. That human connection I felt- this is just a terrible thing." Laura says Kentucky has been so hard hit in terms of drug-dependent babies. "When I went to University Hospital's neonatal [intensive care unit], I saw about half the babies there were born dependent on drugs - which was just shocking to me. "I get over days like that by really realising I am a human being and need to decompress and have some downtime to deal with my feelings. When these things are hurting me, I am hopeful that I am bringing some change to the situation - and that makes it worthwhile to show other people what is happening." Over the years the stories Laura has reported on about the opioid epidemic have changed. When she first started reporting on "opioids" the newspaper felt it necessary to define the word for readers. No longer. The story has moved on - what started with over-prescribing for pain relief became a different problem when legislation was introduced to make it more difficult to get opioids - and consequently those who had become addicted turned to street heroin. Now the concern is deadly fentanyl. The Jefferson County Coroner, Barbara Weakly-Jones, explained how the overdose numbers have increased - from 218 deaths in 2015 to 323 in 2016, and reaching 424 deaths in 2017. By mid-September this year the total had reached 205. In 2016 12% of heroin overdoses included fentanyl or an analogue - in 2017 that number was 62%, and in 2018 to date, it's 70%. As Barbara put it - "you don't have any idea whether there is fentanyl in the heroin or not - until it is too late." To put it into context, she compared the death toll from drugs with the number of homicide deaths - 58 in 2018. 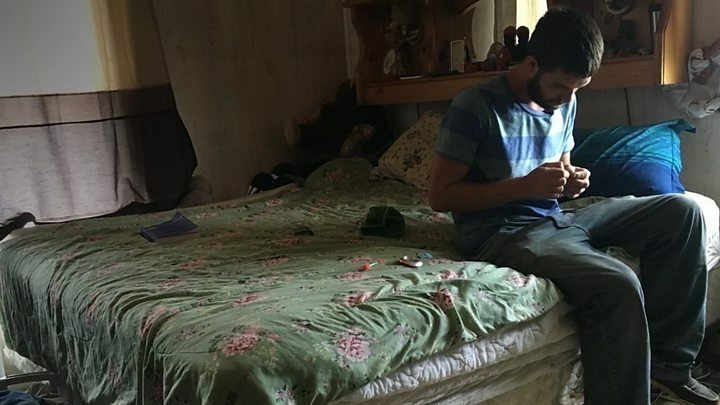 There are signs that the response to the epidemic in Louisville is having an impact - the overdose deaths may be stabilising, in part due to the efforts to make anti-overdose Narcan available to first responders, as well as family members and the public. A needle exchange has expanded its numbers, while recovery centres such as the Healing Place have increased their capacity. But for all the steps forward, the scale of the crisis can seem overwhelming. "Even when I feel like I did a good job on a story I always feel this problem is huge, its much bigger than me, bigger than this town. All the country is struggling with this problem,' says Laura. Emily Walden says she is pleased that the state cases are progressing, but says the federal government is not doing enough. "From the first time, I was there in Washington, there was zero legislation and now there is lots of legislation being proposed. But we are not nearly hitting what we should. There were 72,000 people died last year, we need to step it up. I am just a mom. I want this fixed. I want people to stop dying and I don't think that is too much to ask."